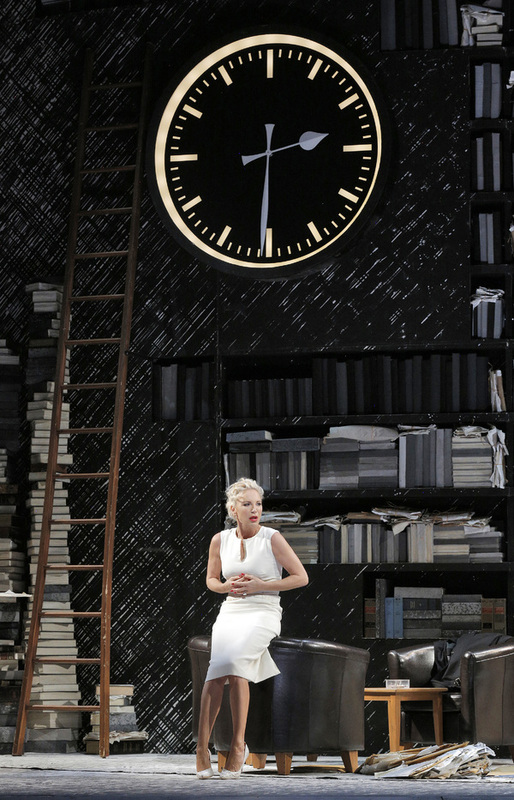 From the San Francisco Opera production of The Makropulos Case, 2016. Leoš Janáček (1854-1928) was a Czech composer known for his combination of folk music with a strikingly original modernism. There is no other composer who sounds remotely like him. He is as instantly recognizable as Vivaldi, Wagner, or Philip Glass. Some have argued that he was the first minimalist composer (of which the Jewish composer Glass is the most famous proponent), but this is an argument which does him a great injustice. His music is not about creating the maximum emotional effect with the fewest notes, or creating hypermodern trance-inducing soundscapes, or some sort of trite musical variations of conceptual visual art. On the contrary, his music is rooted deeply in the folk music of the Western Slavic world. It is the frequent presence of this humble, though not necessarily quiet, simplicity that accounts for a lot of the traces of proto-minimalism heard by some critics. Janáček’s sound is at various times as clunky as a pair of muddy farmer’s boots, as muscular and razor-sharp as a bar fight, as intimate as a conversation with a dear friend, as masculine as a military march, and sometimes a heady combination of each. It is modernism in the very best sense, done right. It is forward-thinking, experimental, and vital, but without the mockery and subversion of tradition and disdain for European culture one finds in, say, the modern music of Jewish composers like Arnold Schoenberg. Janáček is a perfect example of how primordial tradition need not remain conservative in order to survive and thrive. That is to say, it is archeofuturist music: a radical incorporation of past and future. For the past year or two, the genre of vaporwave has been in vogue in White Nationalist circles, especially among younger members of the movement, for whom the 1980s were a period in which some of their values (aesthetic, social, political) were seemingly dominant. Vaporwave, generally a combination of electronically altered and/or sampled thirty-year-old pop hits and synthesized drum beats, is rooted in a reverence for this time period. Those old enough to remember the decade know that this reverence is largely misplaced, but for those who did not live through it, or those who only remember it through the rose-colored glasses of childhood, it seems like the last golden age of white America: an America of neon, pastels, cleanliness, Ocean Pacific clothing, teenage mall excursions, safety, a lack of all-pervasive cultural irony, and a simple joy in being. The music is attractive in that it is a pop variation of what one finds in the music of Janáček: modern sonic textures and rhythms built upon an archive of collective cultural memory. The appeal of both vaporwave and Janáček is based in the universal human need to reconcile the past with the present and to find a solid footing for oneself on the unbroken, primordial arc of one’s culture – each of which is necessary for a successful future. In vaporwave, however, we can hear hints of a deep melancholy, a subtle admission that the past is virtually meaningless, and all that is left is to, somewhat ironically and passively, yearn for a pre-ironic era. It comes perilously close at times to being little more than nostalgia (the “traditionalism” of cowards, an emotional escape into a dead world, the use of memory as an opiate). In Janáček’s music, we hear this reconciliation of the past with the present, but instead of a melancholic despair, we hear the voices of the past speaking clearly in the present, asserting their relevance within the context of the moment. Through sheet music, live performances, and recordings, these voices from two “pasts” (two points on the same historical arc) have carried on into the future – as all serious music is supposed to do. Janáček’s is the music of life. It is rooted in the nooks and crannies of village histories and ancient melodies yet, especially for its time, is decidedly cutting edge, unabashedly futuristic, and urgent. Nor is there a trace of irony anywhere to be found. Janáček’s music negotiates the fuzzy and sometimes confusing boundaries between revering the past and moving excitedly into the future. If one reformulates this notion as being, at its very core, a negotiation between death and life (past generations and future generations), one can find substantial commentary on it in his opera, The Makropulos Case (1926). Based on a play by the Czech writer Karl Čapek (oddly enough, the man who created the word “robot ”), the opera is about a three-hundred-year-old woman, Emilia Marty, and her interactions with a group of people at what turns out to be the end of her life. Having been given an experimental potion by her alchemist father in 1585, she became immortal. In Prague in 1824, the opera’s setting, she exists as a beautiful young woman who makes her living as a particularly sublime singer of great fame. The opera begins in a lawyer’s office, in which a case related to inheritance is being discussed. A rich man died intestate and two people are fighting over his property. Even this very first plot point relates to our theme of Janáček’s archeofuturism: the balance between the past, present, and future. Two men desire the property of a man of a different generation, but there is no will. Without a written document explaining the postmortem wishes of the rich man, there is confusion, that is, there is no agreed upon path into the future. This confusion ends up being resolved by Emilia’s entrance into the scene. She knows exactly where the will is. Of course, everyone present is surprised, and she cannot explain how she possesses this information without giving herself away, but it is because she actually knew the man. Indeed, he was the only man she had ever truly loved. The listener is presented with two basic forms of historical knowledge: documentary and oral. The oral history of Emilia (unwritten, existing purely in memory, a folk knowledge that is passed from person to person) takes precedence over documentary knowledge. The “truest” history of a people is that which has survived numerous generations without needing to be documented. It is present everywhere, often unspoken and taken as a given. For White Nationalists, this unspoken history is rooted in biology, and its branches extend to every facet of life. This oral history works in harmony with documentary histories, allowing them to be interpreted correctly, within the proper (ethnically or racially-specific) context. We hear this in the overture as well: at times jaggedly fresh, at other times pastoral and folksy, with an energy that builds on this tension. Primordial rhythms, melodies, and emotions mix with cutting-edge modernism. Both the music and the plot of the first act are electric with archeofuturist undertones. The truth is then revealed. Emilia Marty’s real name is Elina Makropulos, the daughter of a Greek alchemist who had worked for Emperor Rudolf II (1552-1612). She tells them the story of her father’s potion, her travels, and her true purpose for being in Prague. She is obsessed with the past because she is still a part of it. History, nostalgia, and three hundred years of life have merged into a blur for Emilia. As David Marks writes, “In Janáček’s operatic recreation, we are given continual aural glimpses into Rudolf’s court and the past which dominates Emilia’s eternal present, as if a psychic trapdoor has opened in the stage.” Very soon after receiving the document, she decides to die. Immortality, she realizes, is drudgery. She attempts to give the document to a young woman, but the woman refuses it, holds it over a flame, and the potion is gone forever. The opera ends with Emilia finally dying, accompanied by heart-wrenchingly powerful music, emotional but not tragic, even with an air of liberation and relief. Throughout the opera, Emilia is jaded and world-weary. She has no joy in her life, drinks too much, and displays the bitterness of one who has grown tired of existence. Her numerous aliases all begin with the initials “E” and “M” (Eugenia Montez and Elian MacGregor, for example) as a way to provide some sort of continuity in her itinerant life, to ground her in a past that has become increasingly remote. The act of renaming herself continuously with the same letters is superficial and pathetic. It is a mechanical nostalgia: a simple tribute to herself that lacks any deeper meaning, an act without spiritual context, without any sense of belonging to a collective history. Emilia is indeed a representation of oral history, but one that we eventually learn is absent any collective identity and thus rendered meaningless and tragic. She is the epitome of individualism. There is certainly no other community of immortals to whom she can attach herself. She is adrift in history, rootless and empty. She is a woman whose only meaning, whose only reason for being, is to be found in a piece of paper and a base, materialistic desire to simply stay alive. She is a conservative. Only upon providing her history to normal, mortal, modern men and submitting to the hand of death does her life acquire meaning. Once she shares her story, she has reentered the human collective. She becomes a fact, a lesson, a narrative, a part of the social organism. Then, through her death, she makes way for the present – which in turn makes way for the future. As she dies, she says the Lord’s Prayer in her native Greek. She has found her roots once again after three hundred years of perfunctory wandering. Mortality is progress. In death there is renewal. The core of our collective identity, our shared history, is one that must be renewed through a regular changing of the guard. We see this happening right now. White Nationalism, the avant-garde of political culture is, in a sense, holding over a flame the document that kept the biological entity that was Emilia Marty alive; it is refusing to allow itself to accept nothing more than new initials and to be subsumed into a boring and sad rehash of a dead past. Instead, it is taking the good of the old – the oral history, the folk knowledge, the primordial identities – and combining them with a vision of the future, a new world in which the best of the old merges and synchronizes with the best of the new, the radical, the dynamic and powerful. Guillaume Faye writes, “It is necessary to reconcile Evola and Marinetti, and do away with the notion of ‘modernity’ produced by Enlightenment ideology. The Ancients must be associated not with the Moderns but with the Futurists.” This new political culture recognizes that to travel through time alone and atomized is to be entirely ahistorical. This approach to the future of the white race, this burgeoning movement, is perfectly encapsulated by the music of Janáček. His musicological work – the collection and study of Western Slavic folk music and his incorporation of its elements into often loud, crashing, angular, and virile music precisely mirrors the idea of archeofuturism. Though Guillaume Faye explicitly rejects folk knowledge as such, it is because he sees it as reactionary. But it is only reactionary if it is used by nostalgics, at which point it either dies or assumes a life of its own and rejects its backwards handlers like an animal breaking free from its cage. If folk knowledge were only a reactionary phenomenon, it would never have survived long enough to be known at all. It would have simply withered on the vine. Folk knowledge is inherently oriented towards the future. Indeed, it can only survive by accommodating the future and by being relevant to the future. In other words, the archaic knowledge that Mr. Faye wants to incorporate into his concept of archeofuturism necessarily contains that folk knowledge which has transcended time, but not the folk. There is no substantial difference between folk and archaic knowledge. As evidence of this claim, one need only listen to The Makropulos Case or other works by Leoš Janáček. In doing so, the power of eternal ethnic and racial truths, the efficacious melding of multiple “pasts,” the might of collective belonging, and an outline for future musical progress will become crystal clear. The music is a commentary on the relevance of folk knowledge (or archaic knowledge, if one prefers) on historical collectives; the plot is a commentary on both this and on the idea of finding meaning through collective identity. Together, Janáček expresses through music the archeofuturist philosophy – the combination of an avant-garde, experimental futurism with the timeless knowledges of European peoples. The need for such music is clear, as we see in a much broader sense with vaporwave, but it would be worthwhile for young White Nationalists to expand their musical horizons and find meaning in music that is exponentially more sophisticated and rewarding – and more specifically white. 1. Guillaume Faye, Archeofuturism: European Visions of the Post-Catastrophic Age (London: Arktos, 2010), p. 45. 2. Leoš Janáček, trans. Norman Tucker, The Makropulos Case, English National Opera Orchestra conducted by Sir Charles MacKerras, Chandos 3138(2), 2007. Compact disc. 4. David Marks, “Janáček: The Makropulos Case,” in the liner notes to Leoš Janáček, The Makropulos Case, ibid. 5. Guillaume Faye, Archeofuturism, p. 45. 6. Janáček, to be sure, has plenty of quiet and introspective works, too, but I find his large-scale symphonic works and operas to be the most satisfying and unique. 7. I chose this particular recording of the opera as my recommendation because, first and foremost, it is excellent. Sir Charles MacKerras was one of – if not the – greatest advocate Janáček ever had. Secondly, the opera is sung in English, which makes it a bit more accessible for newcomers and others who resist opera because it seems impenetrable.